TBILISI, DFWatch–An MP from the ruling coalition who was recently criticized for praising Joseph Stalin, announced that he plans to resign as member of parliament after a draft bill he proposed has been discussed. Gogi Topadze from the Industrialists Party explained in a statement that he is leaving because of a difference of opinion with his colleagues, but it is unclear what exactly they disagreed about. In the beginning of his statement, Topadze writes that the political forces of the Georgian Dream coalition were united by the hope and faith of Bidzina Ivanishvili, a businessman who put together the coalition to defeat the former government through the election box, after years of protests demanding its resignation. Topadze writes about the shortcomings of the previous government and his goal of changing the country’s ‘inappropriate course’. Although he has decided to quit as a member of parliament, Topadze vows to continue supporting the coalition. “At this stage I consider leaving the parliament earlier than my mandate expires so that my opinion about certain issues won’t be a hindrance to the goals of the coalition and the party in establishing a normal and peaceful situation in the country,” Topadze writes. Finally, he added that he will leave only after parliament finishes debating a bill about protection of biodiversity. “It has to put an end to the introduction of live genetically modified organisms,” he adds. Earlier this year, Topadze made waves by arguing that Georgia might be better off joining the Russian-led Eurasian Union than pursuing a Western course of integration with the EU. A little over a week ago, he was invited on to Maestro TV for a debate with a member of parliament from the National Movement. In that debate, he glorified Stalin as ‘the greatest Georgian’ of the 20th century, and suggested putting up portraits of Stalin in every office. 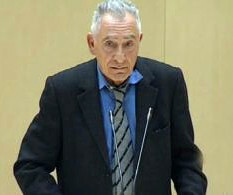 Not only the opposition and other government opponents criticized Topadze, he was also criticized by members of his own coalition. Some cabinet members also distanced themselves from him. It is still uncertain who will replace Topadze in parliament. Zurab Tkemaladze, party secretary for the Industrialists, told journalists that after Topadze leaves there will be one month to propose a replacement among the other names on the party list.